RECOT transforms coordinate of next-generation sequencer reads from your genome/gene to other species genome. 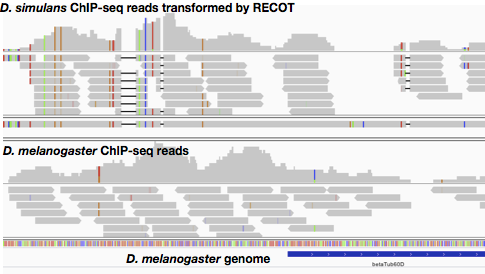 RECOT is useful to compare RNA-seq, ChIP-seq and CLIP-seq sequences between closely-related species. As example, we here transform coordinate of ChIP-seq reads on D. simulans to D. melanogaster genome. "sample" directory contains chromosome 2R of both D. simulans and D. melanogaster, and SAM file contains ChIP-seq result mapped onto D. simulans genome. Scripts will suggest you the next action. By changing settings in configuration file "settings.ini", you can change both input and output file names. Don't worry when you do not have Git! Download the zipped codes and extract it. First, extract gene sequences. "recot_extract.py" will generate "sample/dsim_geneseq.fasta" which contains gene and its regulatory regions (upstream and downstream 500bp as default). Map the sequences in "data/dsim_geneseq.fasta" onto target genome. We here use GMAP to map the sequences. By changing gmap option "samse" to "sampe", it can handle paired end sequence. Then, you can select the best matched sequences from the SAM file. Map your reads onto original genome sequence (In the running example, D. simulans). Mapped result file in this sample is "data/ERR020078-2R-1M.sam", which only contains reads mapped onto the beginnings of 1Mbp of chromosome 2R. Combine gene sequence mapped result against reference sequence and read mapped result against target genes/genomes. This step may require a few hours (depend on number of reads and CPU/Disk speed). When recot_convert.py is successfully finished, the script shows the way to convert the result SAM file into BAM file. To visualize the result in IGV, you can use the ERR020078.on_dme.bam (and ERR020078.on_dme.bam.bai). Q. Can I change configuration file? By adding option "-c", you can change the file name from "settings.ini". Q. Can I transform coordinate of RNA-seq reads even when I do not have genome sequence of original species? Yes. First, you prepare gene sequences in FASTA format (From RNA-seq reads, you can use transcriptome assembly software such as Trinity and OASIS). Then, by skipping "recot_extract.py" in the above procedure and specify the result file at gene_seq_file parameter in "setting.ini", you can transform coordinate of the reads. Q. I would like to use prepared orthologous gene relationships between two species. Prepare the tab delimited file containing gene-gene relation (sample/relation_dsim_dme.tsv). First column is gene name of original species, and second column is gene name of target species. In setting.ini, you need to change two parameters. 1. change the value of "gene_set" to the file including orthologous genes. 2. set target_gff_file, which contains gene names and their regions of target species with GFF format. Q. Samtools give up convert of SAM to BAM halfway with some errors. What's wrong? Q. I have billions of reads. Can I increase the speed of the transformation? To change a setting file, you need to add "-c" in the command in qsub_convert.sh and run recot_samjoin.py with -c option.